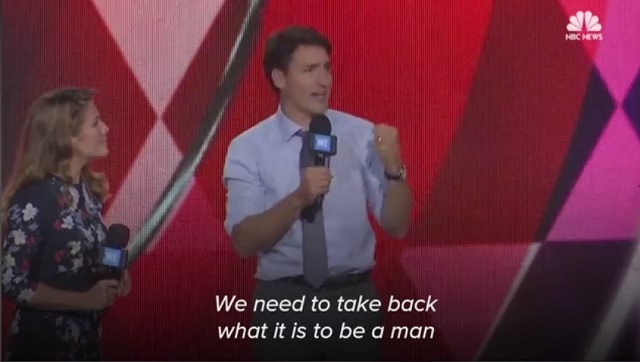 Canadian Prime Minister Justin Trudeau called for "Bro culture" to come to an end and said all men need to become feminists and "shut down" one another's "negative conversations" in locker rooms. "It's not only that men can be feminists, it's that men should be feminists as well," Trudeau said with a lisp Wednesday at a United Nations youth empowerment meeting in New York. "'He for She' is a movement I hope you all of you go up and sign up for of men standing up for women, men shutting down some of those negative conversations that we get in locker rooms, in bro culture," he said. "We need to know that we are better than that," Trudeau said. "How we treat our sisters, our girlfriends, our cousins, our mothers and the world around us matters. We need to take back what it is to be a man and that means being open, compassionate, respectful and brave about standing up for it." This is what meth does to you. Earlier this year, Justin Trudeau said immigrants to Canada were more Canadian than natives because they made to choice to come.